We are located 1/2 between Lindsay and Val–Vista on Main Street, in Mesa Arizona. The section of Main street we are on, has very little residential traffic, which means in the evening it is very quiet. Most people are surprised. I-60 is the 3rd major street to our South and the 202-Loop is to our North. Gilbert is a good exit from either. Then East on Main for a block and a half. (That way no U turn is needed.) Our blocks are a mile each so major cross streets are a little farther apart then you would think. 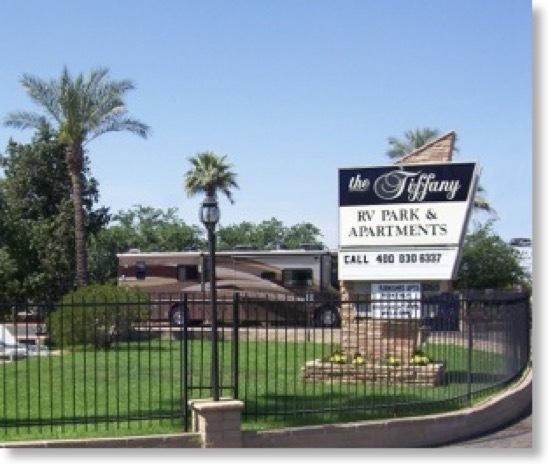 Look for our monument sign that says “ The Tiffany ” as seen in the picture below. You can’t miss the sign and the grass. 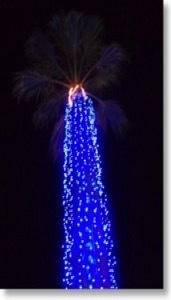 In the winter, at night we are easy to locate by our bight blue palm lit with LEDs, that lights up the front of the park. It is kind of a work in progress. We keep trying to make it easier to replace the bulbs every year, on this VERY tall palm tree. It is a lot of work, but many guests tell us if it is not on at night, they drive right by the park. We are in an area that caters primarily to Senior Snow Birds. The area is heavily populated with all the major RV dealerships and repair shops. There are two Camping Worlds in the area. One is right down the street about a block away, and has recently been remodeled to be on of the largest on the west coast. There are many, many, larger parks around us which are very nice, but charge extra for every thing. Many of our guests that tell us they don’t need a pottery room, wood working room, billiard room, bingo hall, and other amenities, so they DO NOT want them included in the price. An interesting fact that will amaze some people is that within about a 10 block circle around our park, there 20 WalMarts. There are four huge, major Malls within a short drive, and many hundreds of popular restaurants. Some of our favorites are, PF Changs, The Olive Garden, Paradise Bread Co, Mi-Amigo's, Sweet Tomatoes, WildFlower Bread, Nando’s, California Pizza Kitchen, BJs, Red White & Brew, Zupas, and MANY, MANY, more. Ask Kim or me about any of these. There is an intersection only about 5 stop lights from us the has 45 Restaurants at the intersection. We sponsor an Electric RC Plane club at the park that goes to a local park to fly 2-3 times a week. If you have ever wanted to get into RC Planes, let Bobby know and we will be glad to help you get into the hobby. If you have planes, bring them down and fly with us. We usually fly a couple times a week then go to a local restaurant and tell each other how well we did. There are always things to do in this area.